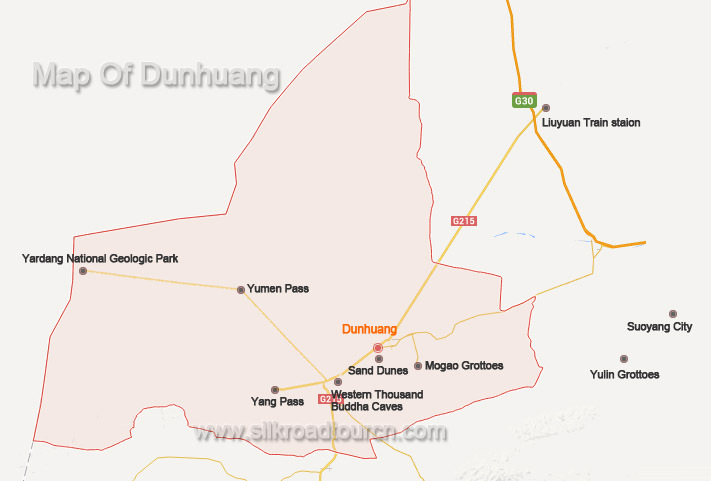 Dunhuang was called “Shazhou” in ancient times (Shazhou means “Land of Sand ”). 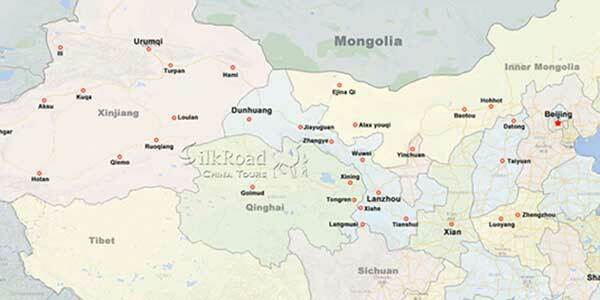 It’s located at the western end of Hexi Corridor, which is a strategic city on the Silk Road. Please note: the time and schedule are subject to change, please check civil aviation ticketing system. If you are from other cities you probably need to take train to Liuyuan (a small town 120 km from Dunhuang) and then take a bus to Dunhuang. Dunhuang has a temperate arid climate, which is dry and arid all year long. The average annual rainfall in the area is only 39.9mm, but the evaporation is 2486 mm. The weather change dramatically with the four seasons. Spring in Dunhung is usually windy and sometimes has strong sandstorm. Summer is hot and dry. Autumn is best of the year, the air is cool and comfortable. Winter can be freezing cold with little snow. The annual average temperature is 9.4 ℃, the highest monthly average temperature is 24.9 ℃ in July, the monthly average minimum temperature is -9.3 ℃ in January. Dunhuang belongs to arid desert climate. which is close to Qilian Mountain, the Dang river, Daquan river and Shule river originated from Qilian Mountain all run to Dunhuang and supplied with it abundant underground water. 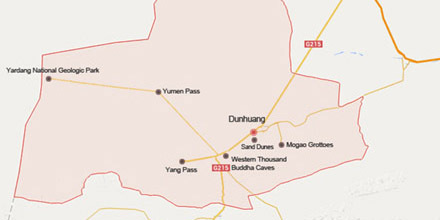 Dunhuang is a typical oasis agricultural area. It has developed agriculture and animal husbandry, where once inhabited by multi-ethnic people whose diet custom was more or less left behind. Some say that from a distance, Dunhuang yellow noodles (Huangmian) resemble threads of gold. While this is somewhat of an exaggeration, these noodles are by no means simple to make. Only the expert chef can properly pull the heavy dough into noodles. The fine thread-like noodles are then boiled in water until they float. However, the noodles are typically eaten cold or at room temperature. 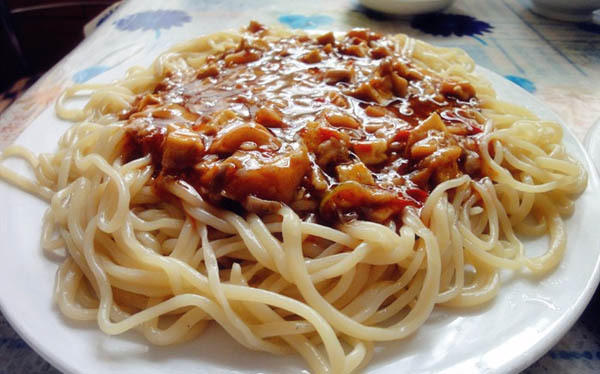 Yellow noodles are often eaten with other dishes as a staple (like rice in other parts of China). On certain murals and frescoes in the Mogao Grottoes, there are vivid portrayals of people making yellow noodles. They're convincing proofs of the long history and popularity of Dunhuang Yellow Noodles. Dunhuang Cold Noodle is the most representative snack is Dunhuang, and it is really a must-have along your Dunhuang travel. 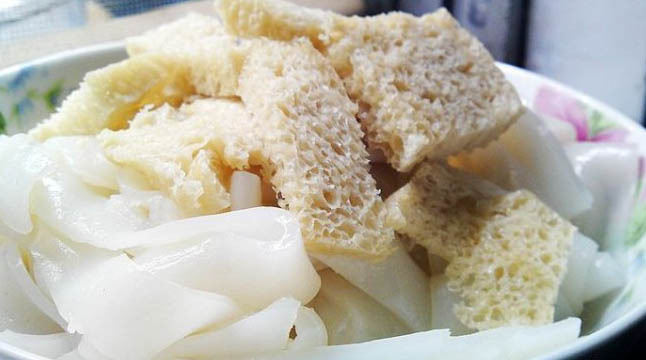 Dunhuang cold noodle is featured with its unique making method and special local flavor. Served with other seasons like vinegar, salt, garlic, sesame oil, cucumber and chili oil, the cold noodle tastes much more delicious. Mutton soup is traditional local food in Dunhuang. Usually plump and sturdy local wethers were slaughtered and cut into large pieces. Then cook in pot with water. When the water boils clean the froth on the surface and put some salt in. when the meat is ready take it out and cut meat off from bones. Then put bones back pot to cook soup. When eating, add some water in the soup and put ginger, pepper, cinnamon, chili, salt, turnip and potato noodles in. meat were sliced into thin pieces and put in the bowl, then scoop boiling soup into the bowl and add green onions and coriander. The mutton soup is good in color, flavor and taste, it’s also nutritious. 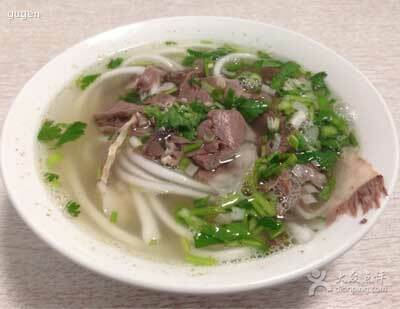 In cold winter, a bowl of mutton soup will help to dispelling cold. 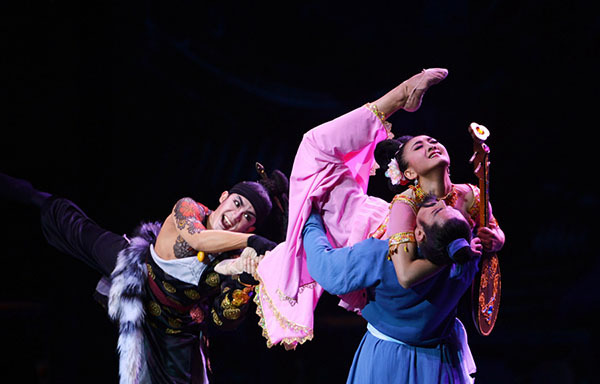 "Silk Road flower rain" is a large Chinese national dance drama created in 1979 by the Gansu Song and Dance Theater, which was based on the murals in Dunhuang Mogao Grottoes and derived from the essence of Chinese folk dance. It has initiated a new route for Chinese folk dance. 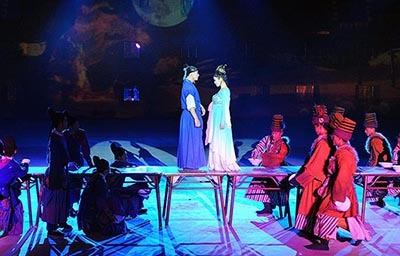 The performance was praised by media as “alive Dunhuang murals and treat of beautifulness”. In the following years the performance was on stage throughout China and received unprecedented popularity. It was also staged in HongKang, North Korea, Japan, Italy, Thailand, France, etc and was deemed as a brilliant work of oriental art and classic folk dance of China in 20th century. 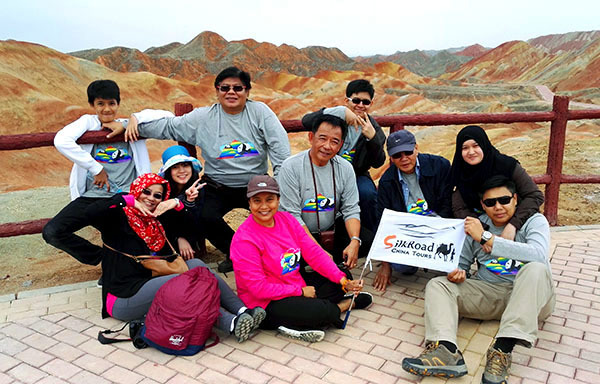 We are the top Silk Road tour operator based in Dunhuang, China. 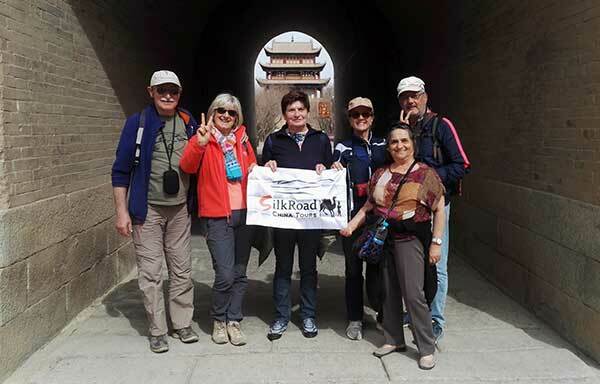 We focus on providing well designed Silk Road China Tours with resonable price and thoughtful service. Your precious comments will be a powerful motivator for us to do better and better. 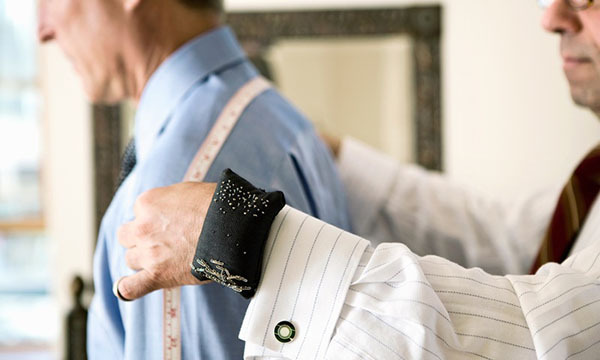 Your final trip plan will be 100% tailored to your needs, incl. itinerary, activities, hotel, meal plan etc. Find you travel companions to share the joys, memories, and expense of the trip.